This Easter lunch menu celebrates spring and life. Easter is a time of renewal. The flowers peek out from their hiding spots, the farmer’s markets open again, and the air smells fresh and new. Easter holds a warm place in my heart, and I can’t imagine hosting at least a small lunch in honor of the day. I am sad that I will not be in Rhode Island this year, so I created a menu that pays homage to the foods my auntie Daniela loves. This Easter menu is simple, fresh, and healthy. It is the perfect way to welcome in Spring… and hopefully the Easter bunny too! I love when you make these menus and shopping lists and prep schedules! It makes me hope that someday I’ll be as organized and put-together as you. I’m sure this will be a huge success! @RhodeyGirlTests, And I wish I had your style! I cannot wait for Easter. I love seeing the signs of new life. Your menu sounds delicious! I also always make stuffed artichokes for Easter. They are one of my favorite things! @Jessica @ How Sweet It Is, Artichokes are definitely my favorite, although I don’t have them as often as I’d like. Any suggestions on what to do with baby artichokes? I found some at the market for the first time! What a great menu! The strawberry shortcake sounds like a great Easter dessert. I love Eastertime too, time with family, time to reflect on our faith, and of course time to expect sunny weather every day again in CA! We are the same, I love your plan of attack! I must plan out the order of everything that needs to be done, and make lists for each dish. Your choices sound wonderful, everything works well together. This will the second Easter in a row that I won’t be with my parents and brothers. We hosted my in-laws last year for brunch, and this year Ray and I are going to be in Paris! So excited, so I can’t complain. First (and probably last) big holiday on our own, it’s going to be fun. @Sarah, PARIS! Have so much fun. It will definitely be an incredible experience. I am a fan of Easter as well, I was born a Saturday before Easter so it’s always been dear to my heart. Your menu sounds amazing! Can you post your recipe for the honey balsamic dressing, as well as the stuffed artichokes? @lauren, Hi! Yes, I will post them in the next couple of days!!! I’m amazed with your planning and organizing skills. You should write a book! @MelissaNibbles, Hmmmmm…. not a bad idea!! Thanks! If I didn’t make lists and plans I would be in big trouble! I am bad at winging it! I just found out that I hosting Easter this year. I created a great Christmas menu and now have to think of a whole new Easter one. Thanks for some great ideas. @Sarah, Thank you!!!!! Will you send me the link when you create the Easter menu? I’d love to see what other people do! Thanks for sharing this! I have been thinking about my Easter menu too — its great to plan ahead! 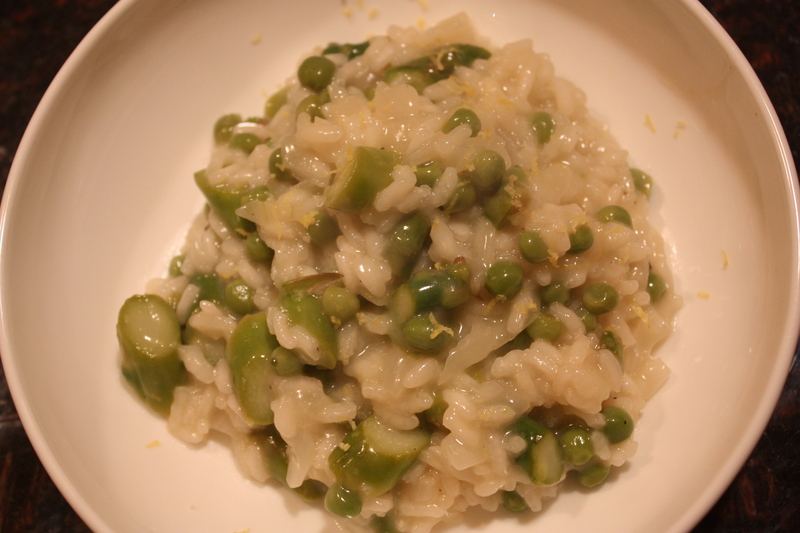 The risotto looks perfect for the spring with the bright green asparagus! I love this menu. What a great way to start prepping! Makes me think that I need to get rolling on this as well 😀 Thank you so much for your comments on my blog. They really meant a lot to me! I’m going to send you an email this week about how I started and let me tell you, it started when I got pregnant and reality sunk in that I had to nourish another human being. Love your site and so glad to know you! Have a wonderful week. @Diana@Spain in Iowa, OOOhh! I can’t wait for that email. Thanks! Can I come to your house for Easter? Pretty please! I am seriously impressed with your menu and planning skills! Can I come for Easter?! @Nicole, RD, Thank you for stopping by! Come on over! youre menu sounds fabulous – cant wait for the recipes! YUM! Everything looks so good- especially the asparagus risotto!